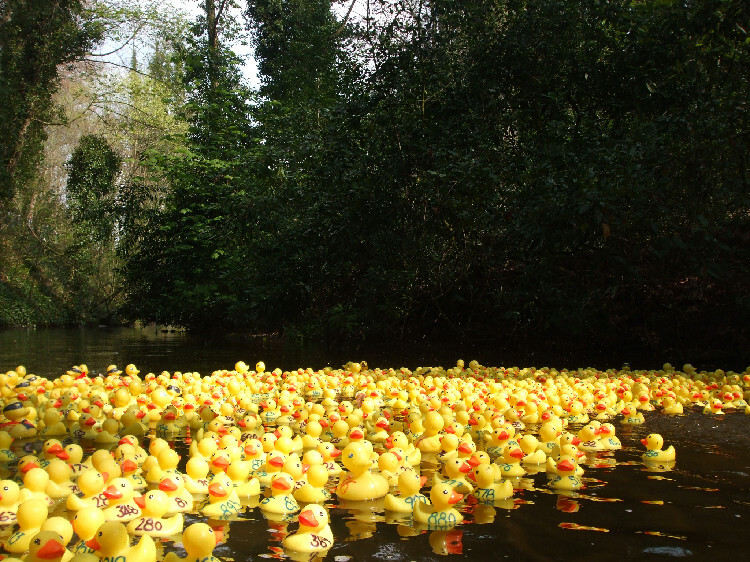 Our hugely popular Duck Race takes place every Easter Monday in the centre of Lymm village. It works by businesses and members of the public buying a duck or two (all racing ducks are numbered), we launch them into the dam and they work their way down (slowly, sometimes very slowly) to the finishing line by the post office. There are cash prizes for 1st, 2nd and 3rd and companies have the opportunity to either sponsor the event or purchase ‘Super’ or ‘Corporate’ ducks. While the race is the day’s main event, there is always lots of other stuff going on too, with rides and stalls for the kids and plenty of food on offer courtesy of the fine local restaurants and other caterers.